Welcome to the Autumn edition of the County Jottings. Our golfing season is complete and we have had a mixture of results. The 1st Team lost the League by just half a point, which was a great disappointment. They had another disappointing result in the County Qualifying at Stoneham which they had gone into as one of the favourites. Here we finished just ahead of Bedfordshire and Norfolk. 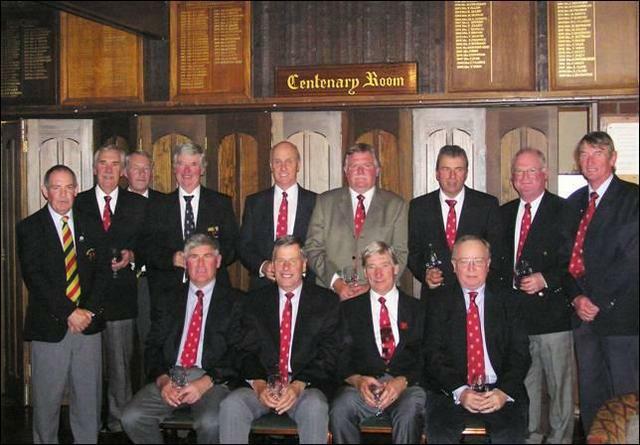 The Seniors, however, once again went on to win the Daily Telegraph Trophy at Old Fold Manor beating Sussex 5½-4½. 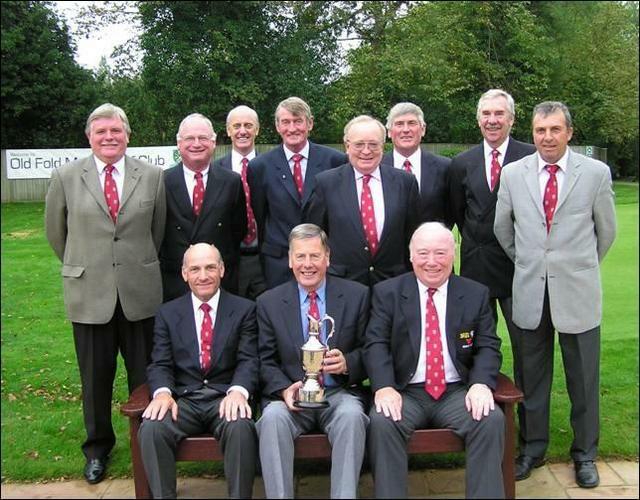 They had less success in the Southern Counties Seniors Foursomes where they reached the final but lost out to Kent 4-1. 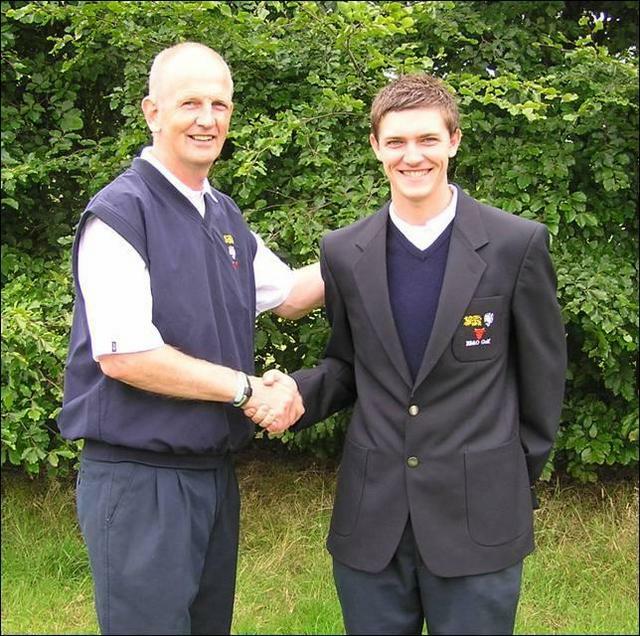 The work of the Golf Partnership continues with the Academy Coaching programme for this year now drawing to a end. A number of recruitment days have been held throughout the summer in order to identify junior players with potential who will go forward into next year’s Academy programme. Once again, our special thanks to all volunteers who work tirelessly behind the scenes to make all of our initiatives such a success. Our 2011 fixture list appears on the following pages and will be updated as soon as provisional dates and venues have been confirmed. Please visit our website to obtain details of our events and to download entry forms. These will be available from late January. Starting Sheets and Results are regularly updated throughout the season and we hope you find this service useful. Our website also contains details of all the Clubs within BB&O and contains links to other useful websites. Please let us know if you would like us to include any other information. Our 3rd League game of the year took us to Woburn on 22nd August to play Bedfordshire. On a beautiful day, on beautiful golf courses (we played The Dukes & The Duchess), we got off to a great start by taking the foursomes 3-1. A much tighter series of singles in the afternoon followed, but we held on to our lead and won those 4½-3½ and closed out the match 7½-4½. The team at Woburn: Will Cooper (Woburn), Kevin Freeman (Stoke Park), Craig Hinton (The Oxfordshire), Roberto Laino (Woburn), Dean Newbold (Frilford Heath), Ben Paterson (Frilford Heath), Liam Robinson (Tadmarton Heath), Ashley Walton (Frilford Heath). In the last match of the year we needed just a draw against Essex to win the League at Bentley on 5th September. All square after the foursomes we hoped to pick up the 4 points from 8 in the afternoon but fell agonisingly short and lost the match 6½-5½. 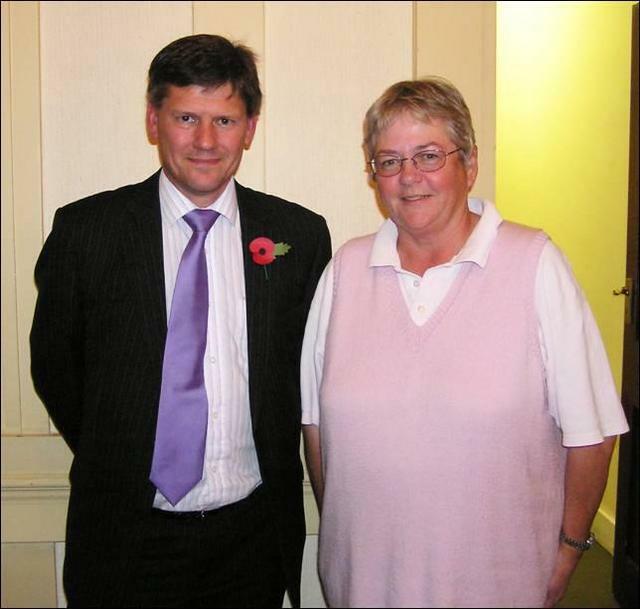 Sandy Bolton (Goring & Streatley) was awarded his County Colours and also picked up maximum points. The team at Bentley: Sandy Bolton (Goring & Streatley), Will Cooper (Woburn), Kevin Freeman (Stoke Park), Tyrrell Hatton (Harleyford), Craig Hinton (The Oxfordshire), Ben Paterson (Frilford Heath), Liam Robinson (Tadmarton Heath), Ashley Walton (Frilford Heath). The Under 16s put on an impressive performance at Abbey Hill on 16th August with comprehensive wins over Bedfordshire and Middlesex. On a very breezy day the team, with two of its lowest handicappers missing, played some superb golf to keep their hopes alive of a four counties league title. Captain Will Cooper and Jake Dines had a double victory 6/5 and 5/4 in the foursomes although we still trailed to both counties overall at lunch. But the singles were a different matter. Will Cooper, Harry Wetton, Ben Beach and Alistair Cameron all won both their matches to set up victory. Jordan Williams and Matteo di Carlofelice both gained valuable points and David Langley won one and ground out a half. Jake Dines was a little too keen to concede a decisive four footer to his Middlesex opponent for this Manager's liking but made up for it with a stunning birdie on the last to secure the team win against Bedfordshire. 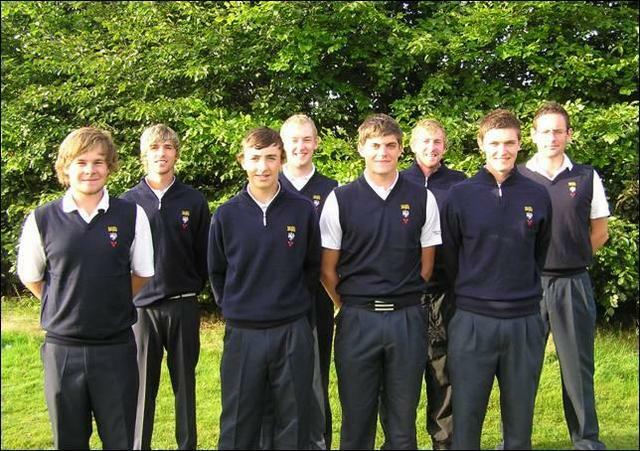 Team at Abbey Hill: Ben Beach (Burnham Beeches), Will Cooper (Woburn), Alistair Cameron (Beaconsfield), Matteo di Carlofelice (Mentmore), Jake Dines (Hinksey Heights), David Langley (Castle Royle), Harry Wetton (Woburn), Jordan Williams (Hadden Hill). The team took on Surrey at Huntercombe on 31st August. This is the 17th time this match has been played and is kindly sponsored by The MUGS. Things were close in the morning with the 5 foursomes shared. The afternoon was a different matter as Surrey took command and won those 7½-2½ to close out the match 10-5. They now lead the series 9-8 and we hope that we overturn that next year at West Hill. Team at Huntercombe: Ben Beach (Burnham Beeches), Tom Butterworth (Harewood Downs), Alistair Cameron (Beaconsfield), Matteo di Carlofelice (Mentmore), Jake Dines (Hinksey Heights), Curtis MacGeever (Newbury Racecourse), Lewis Rapley (Castle Royle), Harry Wetton (Woburn), Jordan Williams (Hadden Hill). We have played all our matches now in the two Leagues which are played as 3 way games between ourselves, Hertfordshire, Bedfordshire and Middlesex. We were delighted to have won the Under 14s League and finished 2nd in the Under 16s League. In the league match on 10th August at Aldwickbury Park against Hertfordshire and Bedfordshire, we drew the morning foursomes against Hertfordshire 2½-2½ and lost to Bedfordshire 2-3. The afternoon singles were cancelled due to flooded greens and the results taken as standing, being 5½-4½ against Hertfordshire and 5-5 against Bedfordshire. In the friendly singles match v Wiltshire v Hampshire at Upavon on 12th August, the team lost to Hampshire 2½-7½ and to Wiltshire 3½-6½. The team at Upavon: Zac Cooper (Harleyford), Patrick Bart (Burnham Beeches), Adam Dewji (Woburn), David Evans (Woburn), Guy Johnson (Woburn), George Joslin (Sand Martins), Chris Little (Frilford Heath), Will Preece (Chipping Norton), Ben Swales (Harleyford), Elliot Wills (Beaconsfield). The team played a league match against Middlesex and Bedfordshire at Thorney Park on 23rd August. They won the morning foursomes against Bedfordshire 4-1 and the afternoon singles 6-4, winning the match 10-5. 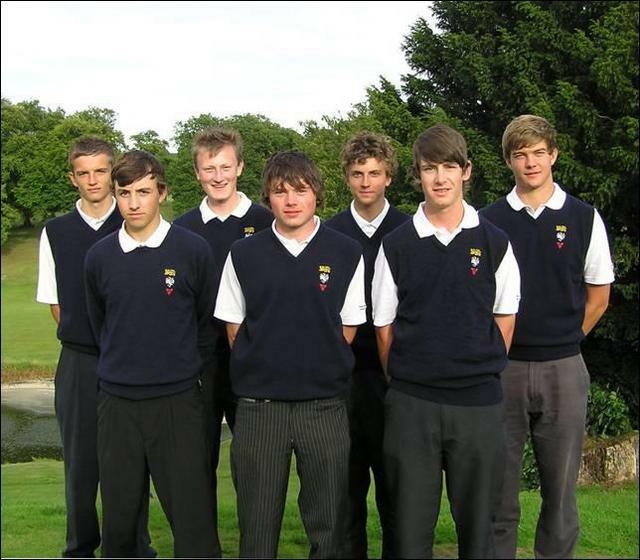 In the foursomes against Middlesex the team lost 2-3 but won the afternoon singles 8½-1½, winning the match by 10½-4½. The team at Thorney Park: Patrick Bart (Burnham Beeches), Sam Boffin (Hadden Hill), Oliver Carder (Henley), Adam Dewji (Woburn), David Evans (Woburn), Guy Johnson (Woburn), Max Nicholls (Newbury Racecourse), Will Preece (Chipping Norton), Zac Cooper (Harleyford), Elliot Wills (Beaconsfield). In the last league match of the season at Pinner Hill on 26th August the team lost the morning foursomes to Middlesex 1-4 but won the afternoon singles 9-1. In the morning foursomes against Hertfordshire the team won 3-2 and the afternoon singles by 7-3, giving a result of 10-5. 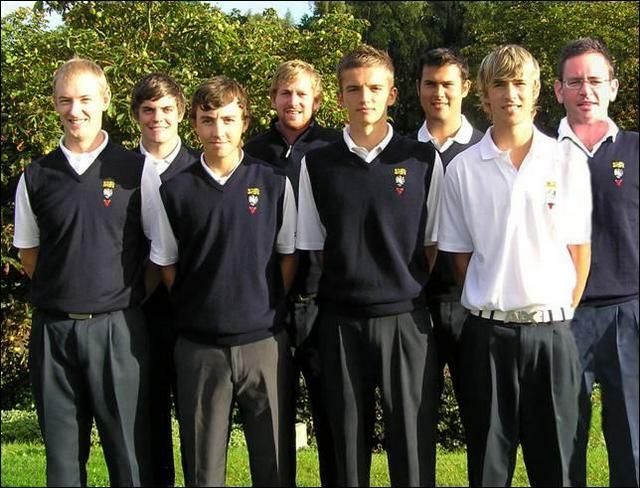 The team at Pinner Hill: Patrick Bart (Burnham Beeches), Sam Boffin (Hadden Hill), Oliver Carder(Henley), Zac Cooper (Harleyford), Adam Dewji (Woburn), David Evans (Woburn), George Joslin (Sand Martins), Chris Little (Frilford Heath), Max Nicholls (Newbury & Crookham), Will Preece (Chipping Norton). In the friendly against Surrey at Wellington College on 16th October the team lost ½-7½. The team at Wellington College: Patrick Bart (Burnham Beeches), Oliver Carder(Henley), Zac Cooper (Harleyford), Adam Dewji (Woburn), David Evans (Woburn), Guy Johnson (Woburn), Max Nicholls (Newbury & Crookham), Will Preece (Chipping Norton). The team played extremely well in a friendly against Bedfordshire at Denham on the 29th August winning the match 5-3. The team at Denham: Harry Baldock (East Berkshire), Sam Boffin (Hadden Hill), Sam Bower (Harleyford), Zac Cooper (Harleyford), Ram Gorania (Abbey Hill), Sebastian Jones (Castle Royle), Robin Sullivan (Castle Royle), Elliot Wills (Beaconsfield). 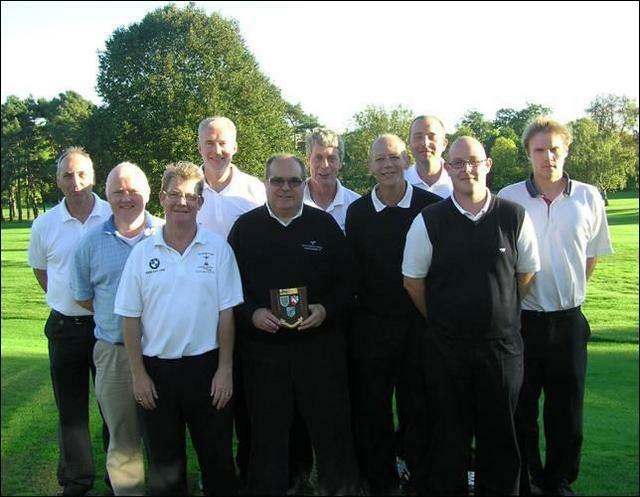 The team were successful in their final League match against Essex at The Berkshire on 16th August. Despite a major scare at the start by losing the first 3 games we played extremely well thereafter to drop just a further ½ point. We secured our place at the top of the Daily Telegraph North League having won all four matches. The Team at The Berkshire: Ashley Brewer (Denham), Rod Crisp (Ellesborough), Adrian Donkersley (Gerrards Cross), John Hunt (The Berkshire), Chris Osborne (Forest Artisans), Cliff Pearce (Ellesborough), Gilbert Runnicles (Gerrards Cross), Phil Sewell (Castle Royle), John Summers (Frilford Heath), Jim Wilson (Frilford Heath). In a thrilling encounter at Old Fold Manor on 14th October, the team just got the better of Sussex (who had also won all four of their matches) to win the Trophy for the 6th time in its 9 year history. With 7 of the 10 games being decided on the last green, everyone - players and spectators alike - was in a state of hypertension. Not good when you are a Senior! Jim Wilson sealed the victory with a monster putt of nearly 50 feet to a cheer that would have put the spectators at Celtic Manor to shame. Team at Old Fold Manor: Ashley Brewer (Denham), Adrian Donkersley (Gerrards Cross), Duncan Forbes (Sonning), Robert Gill (Gerrards Cross), Chris Osborne (Forest Artisans), Cliff Pearce (Ellesborough), Gilbert Runnicles (Gerrards Cross), Phil Sewell (Castle Royle), John Summers (Frilford Heath), Jim Wilson (Frilford Heath). 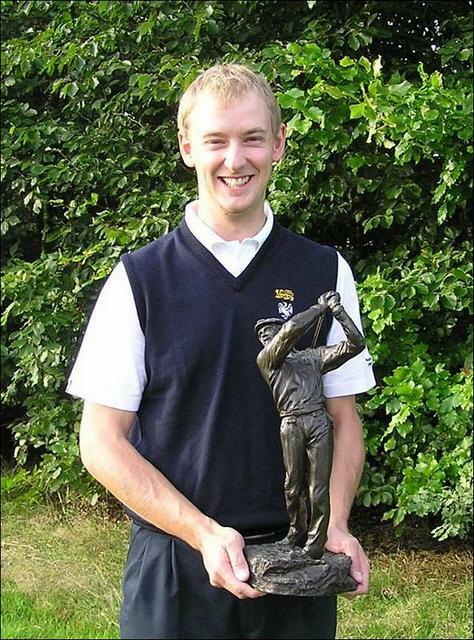 Tyrrell Hatton (Harleyford) added the Autumn Trophy to his list of successes at Oxford City on 10th September. A really close run contest saw Tyrrell squeeze home by just 1 shot from Gee Jabble (Buckinghamshire) with Luke Williams (Donnington Grove), Ollie Tite (Witney Lakes) and Sandy Bolton (Goring & Streatley) another shot back. The Final was played at Ellesborough on Saturday 2nd October and many congratulations to Castle Royle who just beat Chipping Norton in a tense and nerve racking contest. It was all decided on the last putt of the last game with everyone looking on - no pressure then! An exciting finish to this ever popular Club event. 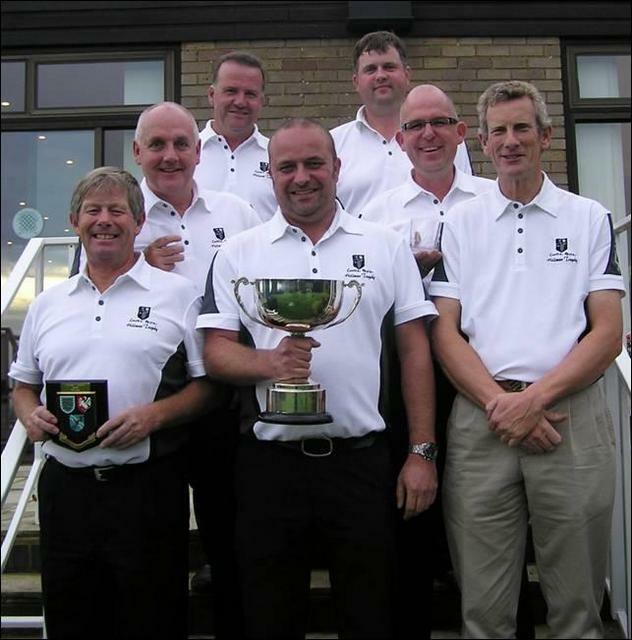 Castle Royle: Richard Busby, Stuart Clarke, Alister James, James O’Donoghue, Philip Roberts, John Waring, Keith Willis (Captain). 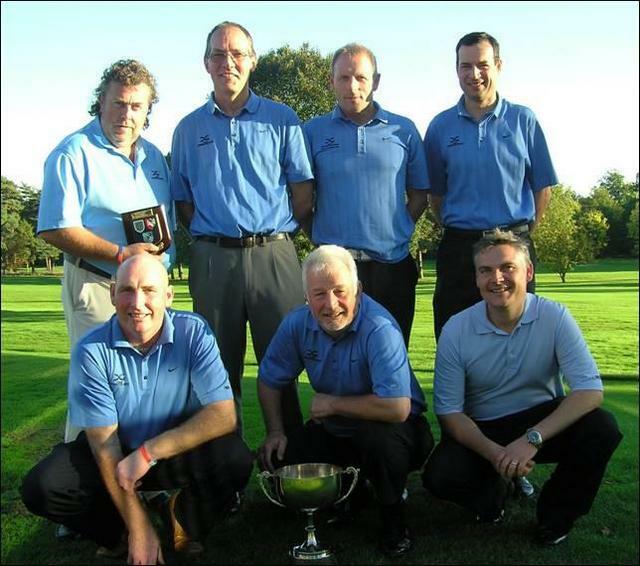 Chipping Norton: Stuart Aspinal, Peter Fife, Peter Griggs, Paul Masters, Phil Morris, Allen Smith (Captain), Steve Taphouse. 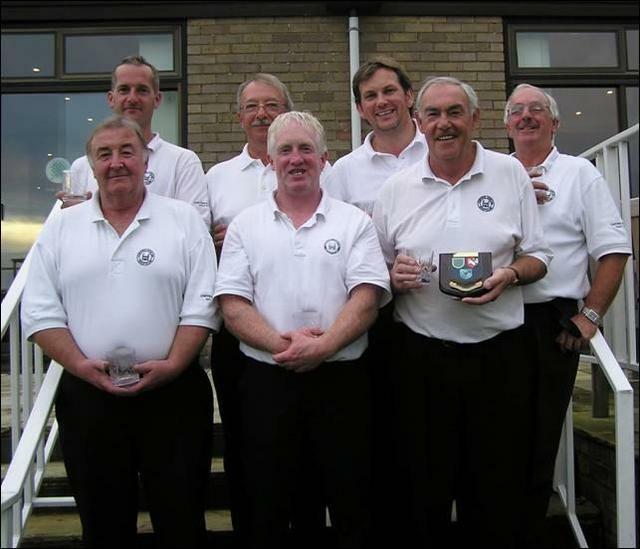 The Final was played at Calcot Park on Sunday 10th October between Donnington Valley and Donnington Grove. On a glorious afternoon the Grove were always in control of the match and ended up beating the Valley by 5-2. Donnington Grove: James Dawes (Captain), Damian Carville, Geoff Kells, Clive Norkett, Mark Seymour, David Spillane, Cliff Walker. Derek Lake, Mike Mitchell, Brian Powers, John Sayers, Nick Wood. On a cold, wet and miserable day at Hadden Hill on 26th October, 36 boys contested the Under 14s Championship. Most adults would have stayed indoors but not these enthusiastic lads! With good scoring very difficult, it was just a question of who could make the least mistakes and it was Chris Little (Frilford Heath) who took the honours from Jamie Smith (Hinksey Heights) by 2 shots with Adam Dewji in 3rd place. Chris Little (Frilford Heath) receives the Salver from Iain MacCaskill (President). Ashley Walton (Frilford Heath) retained his title after a very consistent season and Sandy Bolton (Goring & Streatley) picked up second spot with his tied 2nd place in the Autumn Trophy. 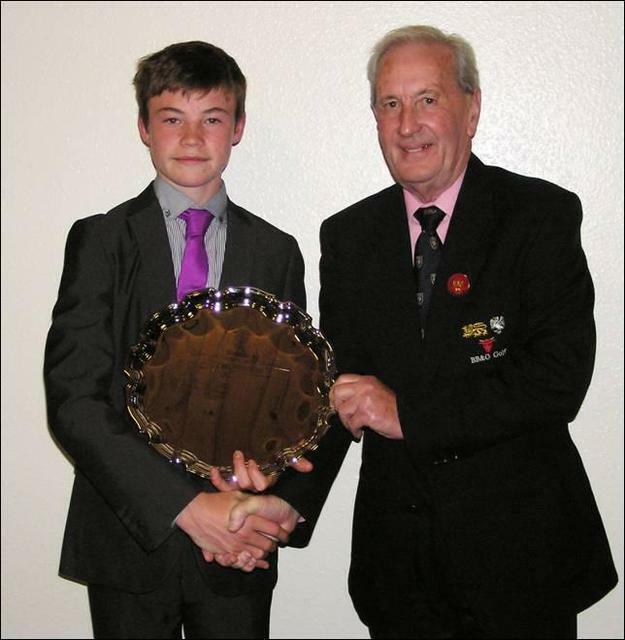 Joe Richardson, also from Frilford Heath, retained his title after a series of high finishes in the Junior Order of Merit events. 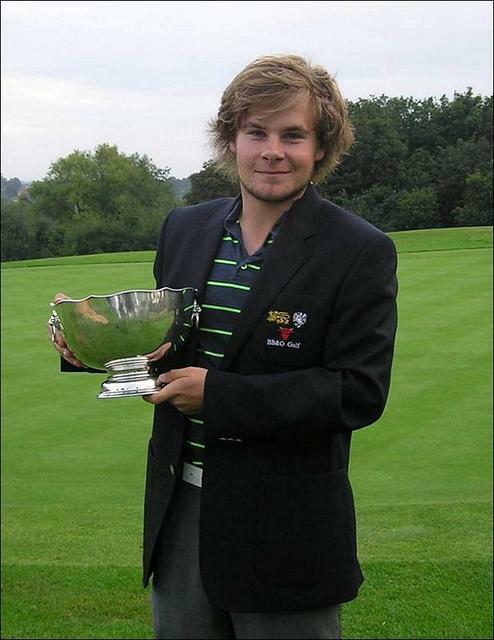 Dean Newbold, the Junior Champion and club mate of Joe, took second place. Are the OOMs a Frilford Heath benevolent fund? We may have to rename the trophies if we are not careful! We finished in a tie for 2nd place at Redlibbets in Kent on 18th/19th August. On the first day we played the host County Kent and Hertfordshire. This would be a tough match with Kent having home advantage and Hertfordshire having the strongest team of the 9 competing Counties. An excellent win against Kent was offset with a loss to Hertfordshire 2-1. Neither of our losses in that match could realistically have gone the other way. The afternoon matches were against Middlesex and Hampshire and we played well to win both 2-1. We were lying joint 1st after day 1 with Hertfordshire, Essex and Hampshire although we trailed in game points. On the morning of day 2 we took on a depleted Essex team who had lost some players through food poisoning and a resurgent Surrey side who had made amends in the afternoon of day 1 after a very poor start, for them, in the morning. We won the Essex match 2-1 but lost to Surrey by the same score. Baring any major catastrophes, Hertfordshire looked sure to win and we needed to win both our matches against Sussex and Suffolk 3-0 to stand any chance. By this time our players were a bit tired and it showed, in the final stretch, as we let a couple of leads disappear and we ended up beating Suffolk 2-1, but losing to Sussex 2-1, when we might have won by the same score. It wouldn’t have made any difference however as Hertfordshire won both their matches to take the Trophy 4 points clear of ourselves, Kent and Surrey in second place. Sussex and Suffolk were relegated and Norfolk and Bedfordshire will take their places at Sudbury next year. Overall a pretty good performance from all the players. Team at Redlibbets: Adam Batty (Hazlemere), Will Cooper (Woburn), David Langley (Castle Royle), Jordan Mann (Stoke Park), Dean Newbold (Frilford Heath), Josh Stanners (Hazlemere), Sam Westmancoat (Reading). We played our preliminary rounds of this event at Copthorne GC on 27th August. One of 4 preliminary events in the South we play Sussex, Hampshire and Surrey for a place in the Final. Having won last year we were in a positive mood but faced Sussex in the morning semi. It certainly didn't look good midway through the morning, but some good fightbacks saw us draw the match but win on the 'Nettell' formula thanks to the big win of Duncan Forbes & Rod Crisp. The afternoon final against Surrey was much easier and we won through 4½-½ reaching the finals for the second year running. 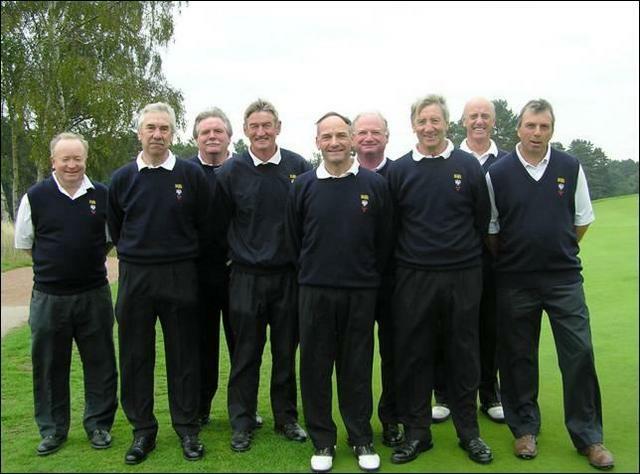 Team at Copthorne: Ashley Brewer (Denham), Rod Crisp (Ellesborough), Duncan Forbes (Sonning), Robert Gill (Gerrards Cross), Cliff Pearce (Ellesborough), Gilbert Runnicles (Gerrards Cross), Phil Sewell (Castle Royle), John Summers (Frilford Heath), Jim Wilson (Frilford Heath). At South Bedfordshire on 21st October we were drawn to play Gloucestershire in the morning semi-final. After a bit of a struggle we managed to win 3-2 to reach the Final. Up against our nemesis in the form of Kent, we got off to a good start in the afternoon and were ahead after 9 holes. Sadly, our form and luck deserted us on the back 9 and our slender leads disappeared as Kent took control and won 4-1. Nevertheless, another very solid performance over the year by the Seniors Team. Team at South Beds: Ashley Brewer (Denham), Rod Crisp (Ellesborough), Adrian Donkersley (Gerrards Cross), Robert Gill (Gerrards Cross), Chris Osborne (Forest Artisans), Cliff Pearce (Ellesborough), Gilbert Runnicles (Gerrards Cross), Phil Sewell (Castle Royle), Jim Wilson (Frilford Heath). David Lane (Goring & Streatley) stormed away from the field to win in convincing style at Harpenden on 21st & 22nd September. His rounds of 70 & 69 saw him take the title by 9 shots. Ashley Brewer (Denham) had two very steady rounds to finish in a tie for 4th place. A turnout of over 50 attended the Half Year Council Meeting on 28th October. The President, Iain MacCaskill, highlighted the achievements of the year. After the meeting the delegates enjoyed the hospitality of Harewood Downs Golf Club with Tess Parkinson (Radley) and Gordon Cottenham (Huntswood) winning first prize in the Greensomes event.